I hope you all had a wonderful weekend. It was a quiet one here with not a lot of going out as it rained a lot but that was good for staying in and working on some projects. I worked a bit on two traveler’s notebooks I’m making. These are fun for me because the way I make them is to include a variety of papers (some vintage) and it’s just a fun and different type of journal. 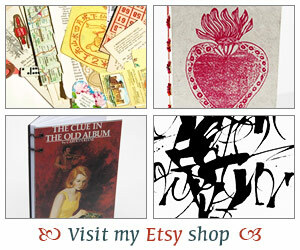 The other project I worked on was my own poetry journal. I’m using an recycled Reader’s Digest book that I made in a workshop a while back to collect my own favorite poems. I still have lot of pages to fill out but this weekend I was able to add a couple of more poems. I finished reading The Crooked Inheritance by Marge Piercy, which I highly recommend. I think I’d only read a poem or two of hers before but I absolutely enjoyed this and had to add a couple of poems from this collection to my journal. The poems I added are: I Met a Woman Who Wasn’t There, The Closet of Doom and In Praise of Joe. Also, I know some of you recommended a few other of her poems to me so I will be looking for those and more by her for sure. For now, I’m waiting on several holds at the library and three of those books are poetry books. I can’t wait to get those. 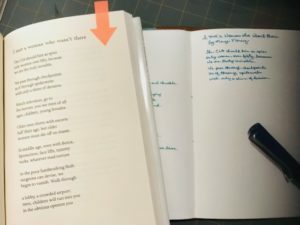 In case you are wondering, sometimes I write out the poems or other times I print them out and then glue them down or use washi tape to add them to a page. It’s exciting to see my journal fill up with poems I enjoy. No doubt it’ll take me quite a while longer to fill this journal but it is a wonderful experience. Let me know if you are reading any poetry book for National Poetry Month or maybe you are even writing some of your own poetry! I love the idea of your own poetry anthology! I am glad you were able to work on projects. Rainy days have their purpose. 🙂 I am glad you enjoyed The Crooked Inheritance. I will definitely add it to my wish list. I hope you have a great week! 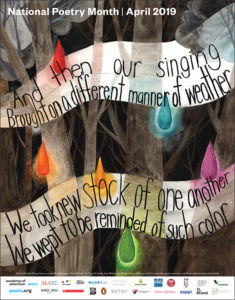 I had great hopes of reading a lot of poetry this month, but so far I’ve only finished one book – Mary Oliver’s “Felicity.” I have a copy of “Colors Passing Through Us” by Marge Piercy to dive into tomorrow. I love the idea of a poetry journal and may have to start one since I seem to be collecting quite a few favorite poems that I’d like to remember.